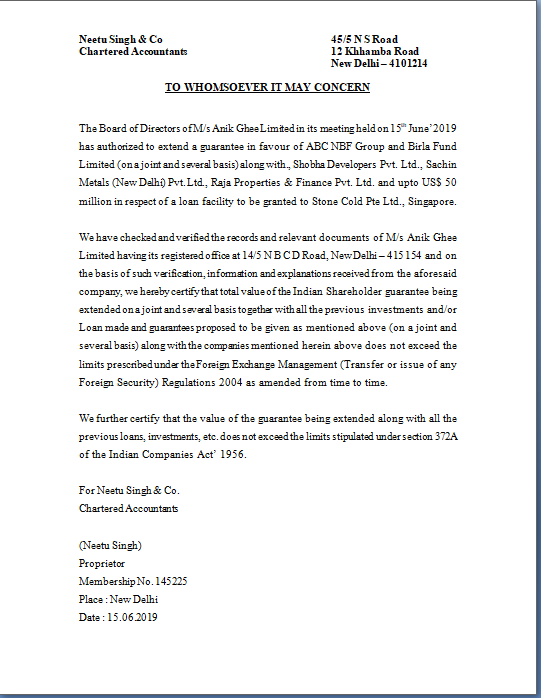 The Board of Directors of M/s Anik Ghee Limited in its meeting held on 15th June’2019 has authorized to extend a guarantee in favour of ABC NBF Group and Birla Fund Limited (on a joint and several basis) along with., Shobha Developers Pvt. Ltd., Sachin Metals (New Delhi) Pvt. Ltd., Raja Properties & Finance Pvt. Ltd. and upto US$ 50 million in respect of a loan facility to be granted to Stone Cold Pte Ltd., Singapore. We have checked and verified the records and relevant documents of M/s Anik Ghee Limited having its registered office at 14/5 N B C D Road, New Delhi – 415 154 and on the basis of such verification, information and explanations received from the aforesaid company, we hereby certify that total value of the Indian Shareholder guarantee being extended on a joint and several basis together with all the previous investments and/or Loan made and guarantees proposed to be given as mentioned above (on a joint and several basis) along with the companies mentioned herein above does not exceed the limits prescribed under the Foreign Exchange Management (Transfer or issue of any Foreign Security) Regulations 2004 as amended from time to time. We further certify that the value of the guarantee being extended along with all the previous loans, investments, etc. does not exceed the limits stipulated under section 372A of the Indian Companies Act’ 1956. For Neetu Singh & Co.